The War of 1812 – 1814 was just over. And while peace again settled on the region, there was still an underlying tension between nations. Colonel John By was the British engineer charged with building a canal that would bypass the upper St. Lawrence River, and especially the Thousand Islands, where shipping was at risk from American attacks. A daunting and dangerous task, the canal had to channel the flow of dozens of lakes through a scarcely settled wilderness and the very durable granite of the Frontenac Arch. Jones Falls, all said and done, is perhaps the most extraordinary construction works of the Rideau Canal. There are two separate flights of locks, separated by a turning basin for a total elevation change of 18 m. The site includes several buildings including a squared timer guardhouse, the Sweeney house, a defensible stone house built in 1841, a blacksmith’s shop, and a frame store house which houses interpretive displays. Another element of this amazing place is the hydro-electric power generation. The pond below the power station is a fish sanctuary, a nursery for bass, perch, pike and minnows that lure sports fishers to this part of the canal. Altogether, there is a terrific canal experience to be had here, well worth a few hours exploration. 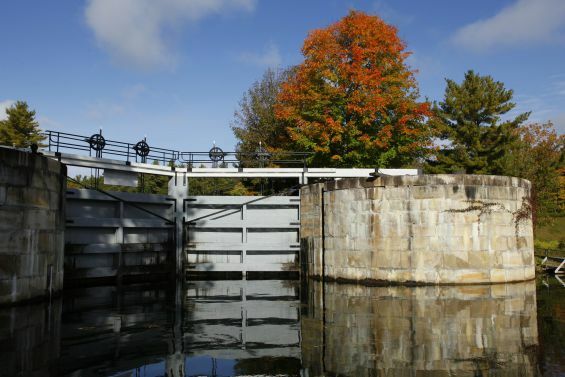 Click here for Ken Watson’s Guide to the Rideau Canal for more information about navigating the canal, history and general canal information. 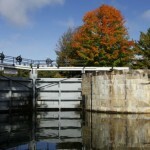 Paddling: Rideau Canal Paddle Routes. 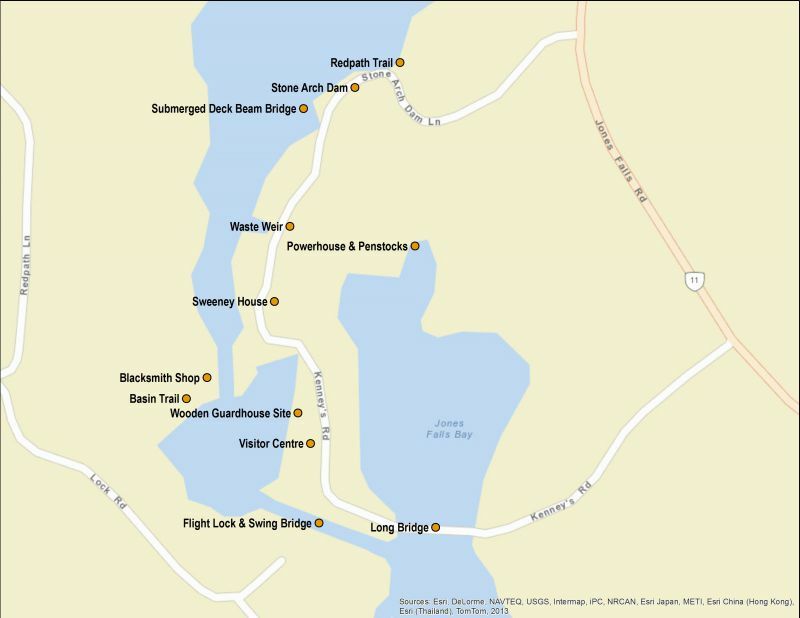 While you’re there, check out the rest of the extensive trail network winding through FAB! 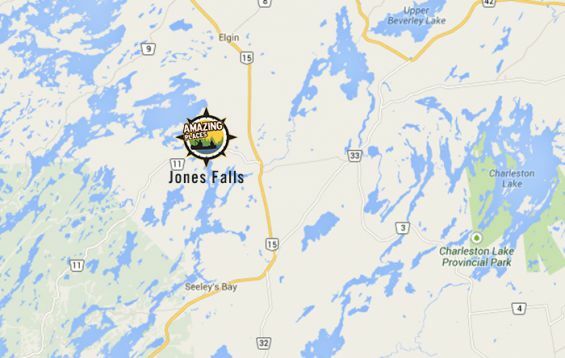 Driving: Jones Falls can be accessed by multiple entry points off Jones Falls Road (County Rd 11). 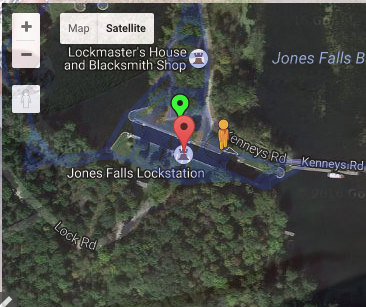 The bottom of the locks and Hotel Kenny can be accessed using Kenneys Road. 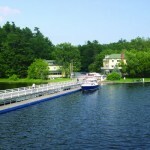 The stone dam is best accessed using the east access of Lock Road. 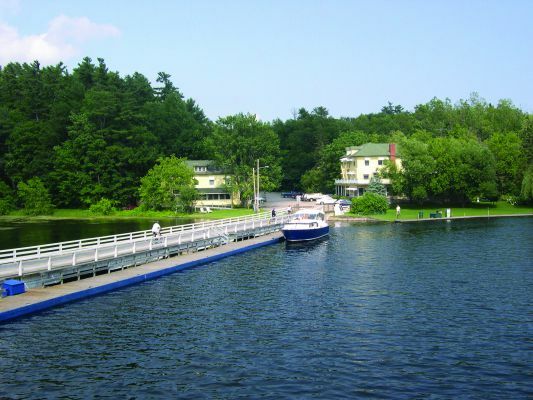 You can also visit the locks using the west access of Lock Road. The site is staffed by Parks Canada during the Spring and Summer but is open for visitors to explore all year-round. This information has been sourced from Parks Canada. Long Bridge: This is the main entrance to the Jones Falls Lockstation. Beginning at the Hotel Kenney, it extends 246 ft to the base of the flight lock. Flight Lock and Swing Bridge: These three interconnected locks share common mitred lock gates like the type originally designed by Leonardo da Vinci. They are more than a metre deeper than any previously built by the British Engineers and therefore have significantly greater water pressure because of their 15 ft depth. Visitor Centre: Originally built as a storehouse around the turn of the century, it is a visitor centre/ washroom/orientation centre which contains an audio/video site presentation and stone cutting exhibit. Wooden Guardhouse Site: The building was constructed between October 1838 and January 1839 to repel a possible U.S. invasion following the Rebellion of 1837. It was destroyed in 1939 but an interpretive display panel marks the site. Blacksmith Shop: This defensible building, with its 2 ft thick walls and metal roof was originally built in 1843 to repair and maintain the canal structures. Two of its unusual features are windows and the forge in the centre of the shop. It was in operation until 1933 and was restored in 1979. Sweeney House: This is one of 12 remaining defensible lockmaster’s houses (termed: “the second line of defence”) that were constructed as a cheaper alternative to blockhouses following the 1837 Rebellion. It has thick stone walls, a metal roof and soffits and gun-slits all around the perimeter. It also has casement windows, which were rare at the time, but were used by the British military because they swung inward and could easily be fitted with fireboards from the inside in case of attack. The building underwent a restoration during 1979-80. Stone Arch Dam: This keystone arch dam, constructed of interlocking tapered vertical stones, is one of the first of its type in the world. Workers during construction called it the “Seventh Wonder of the World”, and is easily the most spectacular engineering structure on the Rideau Canal. Submerged Deck Beam Bridge: This is a recently explored class ‘A’ artifact dating from the construction of the canal. It consists of four piers supporting an 18 ft-wide roadway with a deck surface covered with clay mixed with small rocks, sticks and leaves. Called a wood timber multi-span deck beam bridge, it spans an intermittent water passage once called the MacDonald Snie. This bridge extends from in front of the penstocks, to a point half way across the present channel, where it connects with a 61m (200 ft) road that joins with the far shore. It was probably used to transport clay used in waterproofing the dam. Similar road construction was also used by the Royal Engineers in the Canadian Rockies. Powerhouse and Penstocks: It was first constructed in 1947 and consists of three – 800 kilowatt generators. Jones Falls is the first of four hydro generating plants from here to Kingston Mills and is owned and operated by Granite Power Corp. with water rights leases from the Rideau Canal. Basin (Smithy) Trail: (approx. 1/3 km) Take care as you traverse this rugged trail. 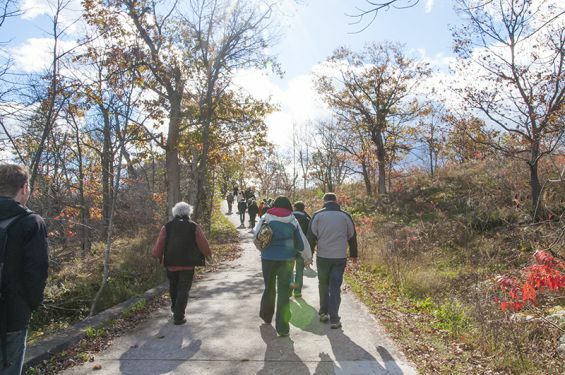 The path exhibits the rugged, irregular bedrock and thin layer of acidic soil characteristic of the geological area of the Canadian Shield called the Frontenac Axis. This trail shows the typical terrain confronting the canal builders, with its rugged landscape covered with white pine, red and white oak, hemlock, ferns and moss. 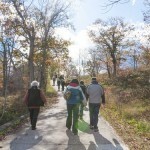 Redpath Trail: (approx. 1 km ) This trail loops from the main parking lot to the long bridge and then through the site past the flight lock, visitor centre, Sweeney House, stone arch dam and then back through another wooded area to its originating point. It is a fine example of varied vegetation, from cleared fields to old pine forests. Near the dam is the northernmost stand of pitch pines in North America. 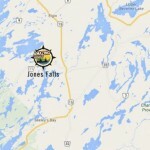 Preview the attractions at Jones Falls before you go! Instant Street View has images of the trails and surrounding landscape.